Ask Logan Davis how he ended up in safety, and he’ll tell you he’s not sure if it was nature or nurture. Logan, who is a Consultant at Ergonauts Performance Technologists, says he grew up in a household where conversations about safety and ergonomics was the norm. “I grew up in a household where conversations about problems always let to the root causes of problems being systems failures. From an environmental, safety and health perspective, the discussion always looked at compliance and behaviors, with the latter of the two accounting for 90-95% of the symptoms,” he says. “I was fortunate to have some of the most brilliant minds in the industry sitting around our dinner table during my formidable years.” At the end of the day, he saw how most issues were due to lack of education/training and organizational culture. “It’s about what is valued and companies that value their employees and have systems to support their employees and prevent problems are the companies that are successful long-term. I want to help develop those robust and preventive systems,” he adds. 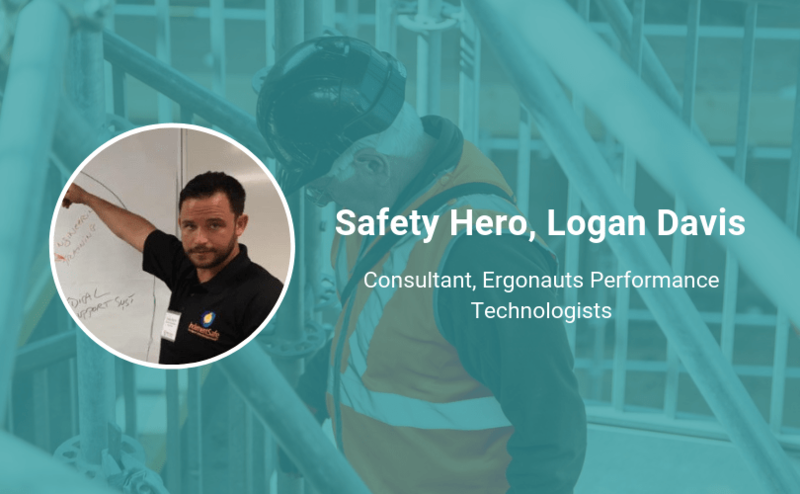 Keep reading to see what Logan says is his advice for someone starting out in safety and how a major school project has shaped his approach to safety and lean ergonomics. What was your first job? Did you have any lessons from it? I grew up on a farm with family and friends who worked hard. When I was 15 years old, I started my first public job. I worked in a small, rural, family owned farm and garden store. I did everything from sweeping the floors to manually loading several tons of seed and fertilizer. I learned the value of true customer service. It doesn’t matter if it’s a customer buying a garden hose or trailer load of seed corn…everyone deserves to be treated as they are your most important customer. What’s your advice for someone starting out in safety? This one is easy…listen as much as you speak. Employees across all industries are subject matter experts. If you take the time to listen to the people we are being paid to support, we’ll typically learn the most efficient and safest way to do a job and we can measure this against regulatory compliance requirements. [That approach] makes it easy to suggest minor changes that are usually required to create a safe and healthy workplace. I decided to specialize in ergonomics for the construction industry after working in several capacities. I’ve done everything from general laborer to Construction Quality Control Systems Manager (CQCSM). Across these different jobs, I’ve experienced the one area that I keep seeing injuries and illnesses (ergonomics are technically classified as illnesses as they are chronic in nature) due to poor ergonomics. Typically, the response to those injuries/illnesses is to address the event that was occurring when the symptom occurred. I have also observed that the majority of S&H professionals are not comfortable addressing ergonomics, especially in the construction industry. The construction industry is particularly challenging as you have people that are always moving into different risk factors. This requires more emphasis on behavioral issues, but it’s all got to be based on a systems approach for it to work. Fixing the symptoms is like sticking your fingers in the holes in a dam: insert finger and the water starts leaking out in another spot. When you fix the system, you fix the dam. My final project when I went through the University of Kentucky’s College of Engineering, Lean Systems Program to earn my Certification in Lean Ergonomics, was a comprehensive ergonomics program for the construction industry. This is where I plan on focusing my energy in the future, as this industry is already in dire need of people making a career there and yet so very little is being done to prevent the illnesses and disabilities caused by poor ergonomics.